DiVa is a CANoe extension for automated testing of diagnostic software implementations in ECUs. 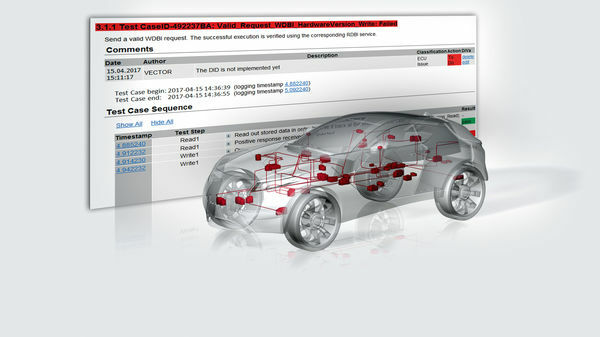 Reproducible test cases are generated based on an ECU diagnostic description in CANdela or ODX format. CANoe automatically executes these test cases and generates a conclusive test report. This means savings in time and effort while improving the quality of ECU diagnostic software at the same time. Generating test cases and automating test execution are two important trends in testing. The system supplier needs extensive tests to support development as well as regression and release tests. Automotive OEMs also need syste-matic tests, especially in integration and release on the vehicle level. CANoe.DiVa is designed to be used by automotive OEMs and suppliers. DiVa is not tailored to a specific automotive OEM, but it allows OEM specific adaptions and extensions by configuration and/or plug-ins. New features allow automatic control of CANoe. DiVa in an existing build and test environment. This allows CANoe.DiVa to be easily integrated into fully automated regression tests. Relative links also provide better support for the use of configuration management systems (e.g. Subversion). Expansion and optimization of existing OEM extensions, e.g. in the area of security and software download. CANoe.DiVa consists of a configuration tool with a dedicated user interface, test case generator and runtime library for extended CANoe test functionality. The generator uses diagnostic descriptions in ODX or CANdela format to generate comprehensive test cases (good and bad cases). It generates a test environment that is added to a CANoe configuration, as well as a test specification with details on the test flow and the individual tests. The generated tests cover both protocol and application scope. The (re-) programming of ECUs for valid and invalid sequences is also checked. The execution results are documented in a clear report. The analysis of the test results is supported by CANoe.DiVa with mechanisms for sorting, comparing, filtering, commenting and further processing of the test results. Validation of the flash programming of ECUs in conjunction with vFlash. CANoe.DiVa can generate tests for the bootloader supported by vFlash. vFlash supports over 90 bootloaders (1/2017). Valid flashing and testing of diagnostic communica-tion with regard to timing and format. Flashing when under / overvoltage. Abort the flash sequence at different points and targeted interruption of the power supply during flashing. Integration of Vector Security Manager. The Vector Security Manager provides OEM-specific security functions, e.g. for diagnostic authentication. Beside the general diagnostic tests (e.g. for ISO14229) CANoe.DiVa also offers additional test support for many OEMs. Please contact us whether your automotive OEM is supported! CANoe CANoe.DiVa version 12 runs with the CANoe variants Full, Run and Pex. Basic requirement is an installed CANoe license, version 12.